I saw Oblivion at a preview screening at an IMAX theater. I’d have to say that seeing the movie that way made for a heightened viewing experience. Even at that, I can’t say that I’d ever had any desire to see a three-story projection of Tom Cruise’s face, particularly in a role in which an awful lot of Cruise’s acting consists of open-mouthed staring at special effects. Maybe Cruise shouldn’t be blamed. The effects in Oblivion — directed by Joseph Kosinski of Tron Legacy fame — offer a lot to tempt wandering eyes. Here’s one post-apocalyptic thriller that doesn’t look like every other sci-fi movie you’ve ever seen. 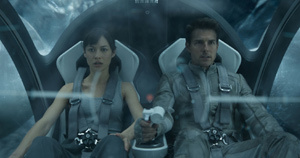 Set on Earth in 2077, Oblivion revolves around a future in which civilization mostly has been destroyed. The planet’s population used nuclear weapons to annihilate an invading army of interplanetary thugs, achieving what may be the ultimate in pyrrhic victories. When the movie opens we meet a two-person mop-up crew that has been left to patrol the war-ravaged Earth before they join the rest of the survivors on Titan, a distant moon of Saturn. The team consists of Jack Harper (Cruise) and Victoria (Andrea Riseborough). The duo periodically checks in with a mission controller (Melissa Leo) who speaks with a folksy southern accent. Jack and Victoria occupy a home above the clouds that has a spare, ultra-modern look, sort of what you might imagine the creators of the Jetsons would have come up with had they taken themselves seriously. You’ll just about have settled into your seat when Kosinski has Cruise flying around Earth in Top Gun-style, only this time his airborne vehicle looks like a cross between a helicopter, a jet and a drone. Not content with one toy for Cruise, the movie quickly provides Jack with another, a motorcycle that detaches from the body of Harper’s aircraft. The movie’s early scenes are devoted to action set pieces, including one that takes place in an abandoned library. Another scene takes us to the top of the Empire State Building, which now sits at ground level. Jack’s haunted by memories of pre-war New York City, but doesn’t know what to make of them. He knows every detail of the last Super Bowl, which he tells us was played in 2017. He wears a Yankee baseball cap, and evidently has given up shaving on a regular basis. The plot — which can be confusing — takes a strange turn when Harper discovers a crashed ship during one of his Earth patrols. The crew has been scattered about in coffin-like containers where they’ve been “sleeping” for an extended period, presumably because they were supposed to make a lengthy space flight. Harper is able to rescue one member of the crew. I guess if you had to pick one crew member to save, you could do worse than the beautiful Olga Kurylenko, last seen in Terrence Malick’s To the Wonder. Kurylenko’s Julia seems to have some sort of connection with Jack. Jack, of course, must be portrayed as having a few special traits. Perhaps that’s why he savors a book that he finds on one of his missions, a copy of Thomas Macaulay’s Lays of Ancient Rome. Jack’s particularly drawn to line about how to die a noble death. If you’ve seen the trailer for Oblivion, you know that a cigar-chomping Morgan Freeman appears in the movie. Best not to explain Freeman’s role in the story, but his character eventually helps drive the plot toward its muddled and disappointing destination. Because the movie’s primary pleasures are visual, it’s worth mentioning that cinematographer Claudio Miranda, who also shot Life of Pi, contributes to the movie’s allure — although Oblivion’s considerable visual pleasures become somewhat repetitive as the action unfolds. So what goes wrong? The troubles seem to have started at the typewriter; i.e., with the screenplay by Karl Gajdusek and Michael DeBruyn, who based their work on a graphic novel and original story by Kosinski. The various plot machinations often defy logic, and the movie includes an epilogue that struck me as a cheat. I also wish that Cruise would find something else to do aside from big-budget extravaganzas that can undermine their intelligence with dumb dialogue (Oblivion has its share) and obligatory action. But that, I’m afraid, takes us out of the realm of science fiction and into the realm of hopeless fantasy.